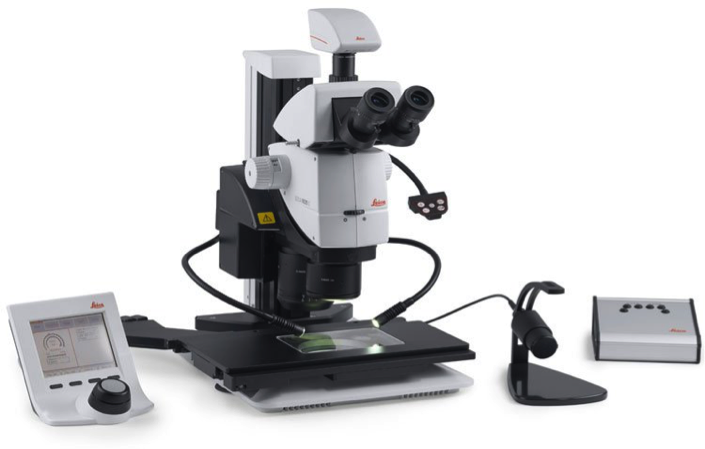 20.5:1 motorized zoom with 7.8x – 320x magnification range and built in display. “Fusion Optics” – combines high resolution and depth of field, resulting in high fluorescence sensitivity and ideal 3-D impression. Resolution up to 525 lp/mm (1x objective, 10x eyepieces), maximum resolution up to 1050 lp/mm (2x objective, 10x eyepieces). “Triple Beam” – exclusive fluorescence illumination beam path for homogeneously illuminated, reflex free field of view and excellent signal to noise ratio. Fluorescence filter sets: ET DAPI, ET Lucifer Yellow, ET Red and ET mCherry NB. Motorized and coded functions: zoom, four position fluorescence filter turret, iris diaphragm and objective nosepiece. Full LAS X software package. 2 Digital Cameras: DFC550 – 12.5 megapixel high resolution CCD, DFC3000 G – 1.3 megapixel Fluorescence Documentation camera. LED spotlight illumination, transmitted light and “Flexi Dome” Diffuse illumination.